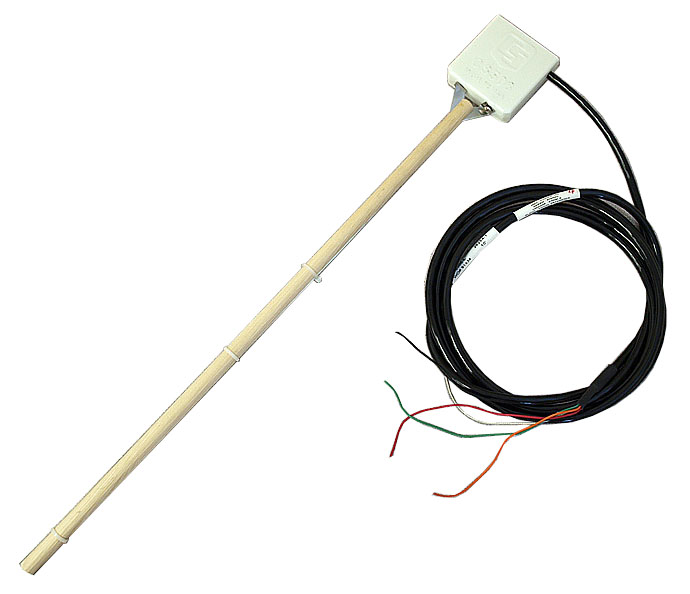 The CS506 is a fuel moisture sensor that measures the moisture content of the 26601 10-hour fuel moisture stick. The 26601 emulates the moisture content of similarly sized twigs on the forest floor. The CS506/26601 combination is used to assess forest fire fuel and is often incorporated in our prewired or custom fire-weather stations. Note: The image shows a CS506 fuel moisture sensor attached to a 26601 fuel moisture stick. The 26601 is purchased separately. The CS506 reports the status of small-diameter (10-hour) forest fire fuels as percent moisture by weight (1%=1 g water/100 g dry fuel). It consists of an epoxy-encapsulated electronics package that uses time-domain reflectometry (TDR) technology to measure the moisture content of the 26601 10-hour Fuel Moisture Stick. The sensor produces a ±0.7 Vdc square-wave frequency that is read using an analog or pulse channel on a Campbell Scientific data logger. The data logger then converts the frequency measurement to percent fuel moisture via a quadratic calibration. The CS506 is typically measured alongside the CS205/107, which measures the fuel temperature. The 26817 Mounting Stake is often used to mount the CS506/26601 with the CS205/107. This stake places the probes twelve inches above the forest floor. Because the probes are mounted parallel to each other, shadowing is minimized. Cable ties are included for securing the cables to the side of the stake. The CS506 produces a ±0.7-Vdc square-wave frequency that is read using an analog or pulse channel on a Campbell Scientific data logger. The data logger then converts the frequency measurement to percent fuel moisture via a quadratic calibration. The 107 Temperature Probe uses a CS205 10-Hour Fuel Temperature Stick.